American River College student Thomas Roberts, 62, died Oct. 22 of cancer while in hospice care. Roberts was a well-known face on campus; he attended ARC for nearly 30 years after sustaining a traumatic brain injury during his first semester in 1978. After the accident, he remained in a coma for 14 days, but eventually recovered well enough to attend courses and re-enrolled in 1989. It was at ARC that Roberts began working with the Disabled Students Programs and Services Department and the Traumatic and Acquired Brain Injury Support group, where he went on to build lifelong friendships. One of these friendships was with counselor Barbara Westre, who had known Roberts for nearly two decades. Westre described both DSP&S and TABIS as a “family” and said that Roberts was an integral part of that community. Westre added that even in while in hospice, Roberts kept up the good spirits. Westre recalled a memory of visiting Roberts while he was in hospice. “If I could just wiggle my nose and make this better I would,” Westre mentioned having said, adding that Roberts just “laughed and laughed” and it became an inside joke between the two when she would visit him. DSP&S Desk Clerk Toni Peters also described Roberts as a good-humored person. Roberts was recognized elsewhere on campus as well; earlier this year he was featured in the Current for an article that chronicled his life story. That printed article now sits on display in the DSP&S hallway covered in signatures from Roberts’ friends. Peters even ended up turning the DPS&S desk into a gallery for some of Roberts’ ceramic art pieces. Roberts is survived by his three brothers: Mark Roberts, who is a fisherman in Alaska whom Thomas Roberts had spent summers with, Joe Roberts, who shared a house with Thomas, and Greg Roberts who lives in Des Moines, Iowa. Roberts’ ashes will be spread out over the Pacific Ocean up near Alaska by his brother Mark, Westre said. According to Westre, Roberts had an especially strong bond with the ocean and enjoyed traveling. 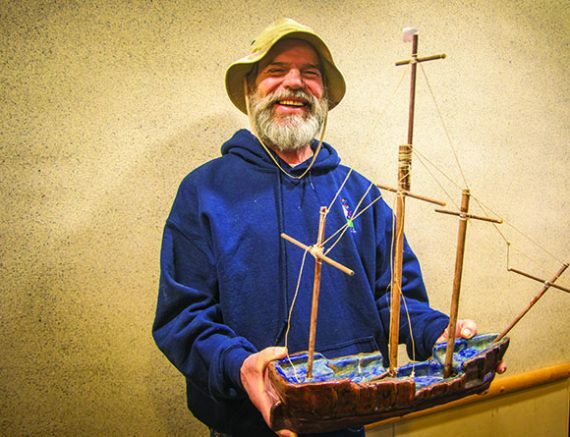 “His plan was to buy a boat and sail up to Alaska. Actually, at one of the first TABIS meetings, Tom drew a map of the earth on the board and asked what everyone thought about him sailing to different locations around the world,” Westre said. Westre and the TABIS group will hold a “Celebration of Tom” ceremony in honor of Roberts’ memory on Dec. 13 in Community Rooms 3 and 4 in the Student Center. Be the first to comment on "Longtime ARC student passes away"